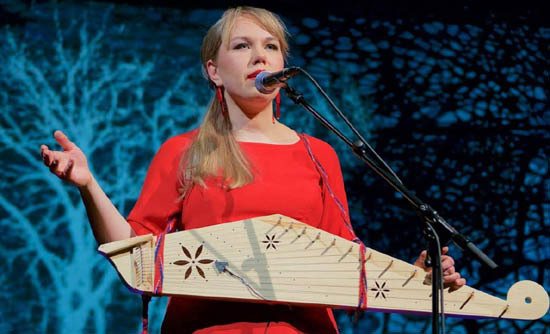 My introduction to the Estonian musician Mari Kalkun came directly through RootsWorld. Kalkun and her ensemble Runorun were recorded live in concert in April 2016, and the music was subsequently shared on RootsWorld’s website and radio show. Upon first hearing this program, I went on a Mari Kalkun binge starting with Runorun’s 2015 release Tii Ilo, and then diving into Kalkun’s back catalog: Upa-Upa Ubinakõnõ (also released in 2015 with Tuuliki Bartosik and Ramo Teder), Vihmakõnõ (2010), and Üü Tulõk (2007). All of these releases are buoyed by hundreds of videos available across the internet. 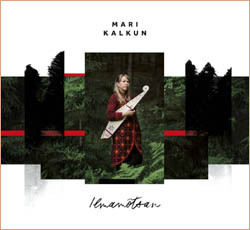 Now Mari Kalkun releases Ilmamõtsan (In the Wood of the World). Rather than exploring the sounds of a full band, most of this new recording is just Kalkun herself. The sonic exploration comes through the multiple instruments she uses to accompany her vocals: 12- and 36-string kanteles, accordion, harmonium, chimes and bells, and various percussive effects, often overdubbed but never overdone. There is wonderful musicality and beauty in each of these backdrops, but it is Kalkun’s vocals that propel these songs. The singing is often soft yet always intense, emotive without lapsing into sappiness, somehow bridging a chasm between soothing touch and a visceral rawness. Even for those of us who speak nary a word of Estonian, these songs are compelling and engrossing. Reading through the English translations, I found even more to draw me into these songs. “Mõtsavele mäng” (The Forest Brother Game) describes meeting five brothers in the forest. RootsWorld Radio #257 features a number of the track from this album.